The three biggest football presidencies in global football come up for election in 2019 with FIFA, the Asian Football Confederation (AFC) and UEFA all voting on new presidential terms. At present the only election of the three that will be contested will be in Asia – current president Shaikh Salman bin Ebrahim Al Khalifa announced his intention to run again last week. He will be up against former Saudi Football Federation chief Adel Ezzat. Rumours are that the Koreans are also showing ambition and that Chung Mong Gyu (younger cousin of former FIFA exco member Chung Mong-joon and similarly Hyundai endowed), will make a bid for the top spot – though he might serve better global purpose by running against Infantino. Ezzat is a newcomer to football administration having only been Saudi football chief since December 2016 before resigning in June to pursue his AFC ambition. His rapid rise to positioning himself as a potential AFC president, coming from what is world football’s current rogue(st) nation, points towards a wider geo-political ambition rather than football aspiration. There has been a hard won balance in the AFC over the past six years. It is a stability and unity which is potentially threatened by government politics and objectives overspilling into its football administration. Will the football people be left alone to vote for football people or will politicians interfere and distort the process? For the AFC probably the best thing that could have happened for the region’s administration in 2015 was that Shaikh Salman lost the run-off for the FIFA presidency to Gianni Infantino – Infantino’s move to FIFA was probably the best thing that happened to UEFA as well. The AFC, covering almost two-thirds of the world’s population, was a football region that was underdeveloped, often unloved and overlooked, and generally wracked by distrust and suspicion – both between its member federations and amongst the wider 150-nation+ football world. It was relatively untouched by the US Department of Justice probe into football corruption – it had other problems of its own. In the wider football world it was seen as a voting block to be manipulated (not unlike Africa today). It was a region that barely registered on the global football consciousness except when Japan or South Korea somewhat condescendingly were recognised as “performing above expectations” in international competition. For Europe’s giant leagues and clubs it was (and for most still is) seen as a series of tiger economies that could provide them with huge TV rights deals and increasingly significant sponsorship cash. Under Shaikh Salman there has been an assault on the old entrenched views of Asia and it has come via the AFC treating its own ailments. Top of the list of cures has been an emphasis on inclusion and expansion. It has enabled the building of a strong administration – easily the most impactful and broad-based executive the AFC has ever had. This has led to a focus on football for Asia and developing Asia’s talent across the board. 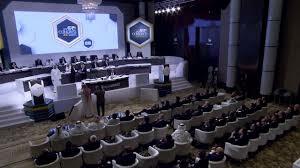 Unity amongst member associations and the strength that brings has also been a feature of the AFC – no better evidenced than when members gathered for a voting congress that would elect FIFA Council members in 2016, voted to suspend that congress before it had even started in mass protest against FIFA’s meddling in their own federation politics. It was a message sent to FIFA and its new president that the Asians under this regime were not for abusing. While Asia was generally kept on the periphery of global football, it was also a region that was locked into a long term and suffocating commercial rights contract that bestowed riches on a few individual marketing agents. It was a contract that strangled the limited finance to develop the region at grassroots and the AFC’s competitions at a global marketing level. Fast forward four years and the AFC in 2018 is one the big success stories of the new world of football administration with a new $3.5 billion+ commercial deal waiting to activate. It is a position a very long way from the starting point when Shaikh Salman first took over to complete the term of the disgraced Mohamed Bin Hamman in 2013. But Salman himself admits the AFC is still a work in progress. And like all works in progress there are potential fragilities. The looming shadows of geo-political interference in the 2019 AFC presidential election is clearly the most dangerous threat to the AFC’s development, for which a break in the continuity could (probably would) prove disastrous for many of the initiatives of the past six years. The role of the Saudis in the election process will need to be monitored. Not liking the established regional set up, the Saudis set up the South West Asian Football Federation (SWAFF) this year, a regional bloc of federations comprising 14 nations (excluding Qatar and Iran). A new regional association with Ezzat installed as the first president. Would he suggest Qatar and Iran shifting to UEFA if he became president? Saudi has also refused to shut down pirate satellite broadcaster beoutQ, which has been stealing beIN Sport broadcast signals and rights on an industrial level. It is a total disregard of international copyright law that threatens the economic balance of sports rights in the region and globally. But then the Saudis have little regard for the accepted order, seemingly operating on the belief anything can be bought. It is their supposed backing of a staggering $25 billion to Infantino that prompted the proposal for the most ludicrous and financially craven sell-off of world football’s calendar ever. The AFC’s geographic, religious and cultural diversity has political conflict in abundance – more than seven of its nations struggle to safely stage home club or national team matches against political rivals. But games get played and competitions have grown in competitiveness and profile. The AFC over the past six years has established a solid foundation and it will need all that strength to ensure a clean election process that doesn’t undermine those very significant gains. That involves letting the football people vote for their football people – and government influence being kept out of the process. The AFC member associations will serve themselves well to remember the progress that has been made and the danger meddling governments pose to their own development.